The Student Information System (SIS) includes a search-and-report tool called Data Center, created by the Office of the Registrar. We are continuing development of Data Center, adding more criteria and refining search results. Data Center is part of the UW–Madison Reporting & Analytics Project (UWRAP), created to ensure a smooth transition from current interactive reporting tools (like Query Library) to a suite of solutions chosen to replace them: the Oracle Business Intelligence Enterprise Edition (OBIEE) platform, Tableau, and Data Center. Faculty and staff with certain roles have access to Data Center, which is located under “Reporting Tools” in the main menu of SIS. If you are faculty or staff with permission to use SIS and don’t have access to Data Center, you can request access. To do so, please complete the SIS Authorization Form. On the form, fill in the top section; under Additional Roles, write “(A) UW_SR_DEPARTMENT_CENTER” to add the Data Center role; obtain the necessary signatures; then submit as directed on the form. The Data Center help document is here. Find all Social Welfare students. 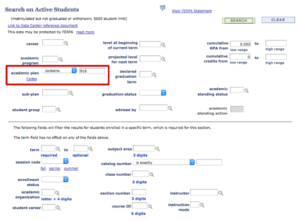 Use the academic plan field to contain the code for Social Work (916). The results will include B.S., B.A., and Ph.D. students. Find Social Welfare students intending to graduate this term. In addition to the academic plan of 916 for Social Welfare, specify a career of undergraduate (UGRD) and a declared four-digit graduation term (e.g., 1172). Find students with 100 or more credits, who are still in Pre-Biological Systems Engineering (not fully admitted to the Biological Systems Engineering major). Specify a range of credits from 100 to something higher (e.g., 999), and the academic plan code of PAE for Pre-Biological Systems Engineering. 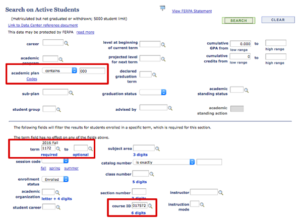 Find students within a specific option within a major (e.g. option in Analysis & Research for the BS in Sociology). 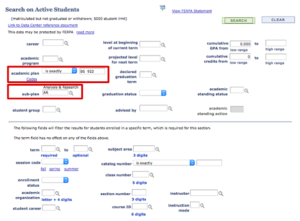 Set the academic plan field to “is exactly” (for the sub-plan field to work, the academic plan field must be set to “is exactly”), enter an academic plan code (e.g., BS 922), then either enter or search for/chose the code for the sub-plan (e.g., AR). Find email addresses of undeclared students who are enrolled in courses in my department (Sociology) this term (Fall 2016). 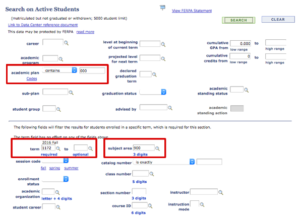 Use the academic plan code of “000” for undeclared majors. The bottom section of Data Center’s fields are criteria related to specific terms. Choose a four-digit term code (e.g., 1172) and the three-digit subject area code (900 for Sociology). Cross-listed courses are still a known issue for Data Center. 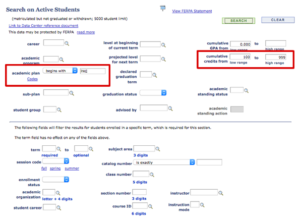 It will only query under the subject area that the student enrolled in for cross-listed courses. 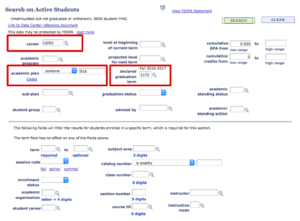 If you want to find—in this example—all undeclared students enrolled in a cross-listed course, use the six-digit course ID field instead of the subject area field (see second screenshot below).